Spaying and neutering is one of the most important things you should do as a pet owner. Not only does spaying and neutering reduce the number of homeless pets that are needlessly euthanized every year, the procedures also have distinct individual health benefits for your pet. There are millions of stray animals who live a very low quality of life because of the pet overpopulation problem. 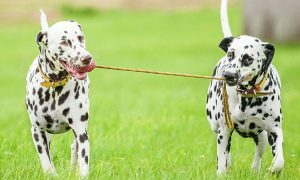 A single unspayed dog or cat can produce hundreds of offspring by the third or fourth generation, which can happen very quickly. Spaying and neutering your pets is the best way to fight pet overpopulation and the suffering those animals feel. Spaying a female dog or cat decreases the risk of breast cancer, especially if done before the first heat cycle. Other health benefits of spaying include avoiding uterine cancer and preventing the life-threatening uterine infection called pyometra. Neutering male dogs has the benefits of eliminating testicular cancer, reducing prostatic disease, decreasing aggression, as well as decreasing behavior problems such as urine marking and roaming. Also, pets benefit from less aggression and less desire to roam, which helps keep pets out of dangerous situations. There are also behavioral benefits such as reduced spraying and marking in cats. Dogs who become restless and damage household items are also less likely to display that behavior.